The Supreme Soviet of the Soviet Union (Russian: Верхо́вный Сове́т Сове́тского Сою́за, tr. Verkhóvny Sovét Sovétskogo Soyúza, IPA: [vʲɪrˈxovnɨj sɐˈvʲet sɐvʲˈetskəvə sɐˈjuzə]) was the most authoritative legislative body of the Union of Soviet Socialist Republics (USSR) beginning 1936, and the only one with the power to approve constitutional amendments. (The Congress of Soviets was the supreme legislative body from 1917 to 1936. During 1989–1991 a similar, but not identical (elected directly by the people instead of local Soviets) structure (Congress of People's Deputies of the USSR) was the supreme legislative body.) It elected the Presidium, served as the collective head of state of the USSR, and appointed the Council of Ministers, the Supreme Court, and the Procurator General of the USSR. The Soviet of the Union, elected on the basis of population with one deputy for every 300,000 people in the Soviet federation. The Soviet of Nationalities, represented the ethnic populations as units, with members elected on the basis of 32 deputies from each union republic, 11 from each autonomous republic, five from each autonomous oblast (region), and one from each autonomous okrug (district). The administrative units of the same type would send the same number of members regardless of their size or population. By the Soviet constitutions of 1936 and 1977, the Supreme Soviet was defined as the highest organ of state power in the Soviet Union, and was imbued with great lawmaking powers. In practice, however, it did little more than approve decisions made already by the USSR's executive organs and the Communist Party of the Soviet Union (CPSU). This was in accordance with the Communist Party's principle of democratic centralism, and became the norm for other Communist legislatures. The Supreme Soviet convened twice a year, usually for less than a week. For the rest of the year, the Presidium performed its ordinary functions. Often, the CPSU bypassed the Supreme Soviet altogether and had major laws enacted as Presidium decrees. Nominally, such decrees had to be ratified by the full Supreme Soviet–- a process that was usually a mere formality. However, in some cases, even this formality was not observed. After 1989 it consisted of 542 deputies (decreased from previously 1,500). The meetings of the body were also more frequent, from six to eight months a year. Between 1938 and February 1990, more than 50 years, only 80 laws were passed by the Supreme Soviet, less than 1% of total legislative acts. New composition 1991, (unofficially 13th convocation) unlike previous convocations, there were no elections for the new composition of the Supreme Council instead members of the council were delegated from the council of union republics that continued to be members of the Soviet Union. Beside the Supreme Council, in the Soviet Union supreme councils also existed in each of the union and autonomous republics. The supreme councils of republican level also had presidiums, but all those councils consisted of one chamber. After the dissolution of the Soviet Union, some councils of the succeeded independent republics simply changed their name to their more historic name or to emphasise the importance of the council as a national parliament, while others changed to double-chamber assemblies. All republics in the USSR were soviet (as soviet national), yet 15 were of union level, while the other, autonomous republics, were subordinated to the union republics. 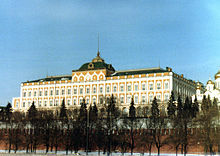 Supreme Council of Russia, until 4 October 1993 when it was dissolved as part of the 1993 Russian constitutional crisis (replaced with the Federal Assembly). Supreme Council of Georgia, during 1992 changed its name to State Council of Georgia. Supreme Council of Kazakhstan, until 1995 (replaced with the Parliament of Kazakhstan). Supreme Council of the Karelo-Finnish Soviet Socialist Republic, during 1940–1956. Supreme Council of Belarus, until 1996 (replaced with the National Assembly of Belarus). Supreme Council of Lithuania, during 1991 changed its name to the Seimas. Supreme Council of Moldavia, during 1991 changed its name to the Parliament of the Republic of Moldova. Supreme Council of Azerbaijan, during 1991 changed its name to National Assembly of Azerbaijan (Mill Mejlis Azerbaijan). Supreme Council of Ukraine, during 1991 adopted the Ukrainian transliterated name Verkhovna Rada (repeating the way the previous parliament was named during 1917–1918, Tsentralna Rada). Supreme Council of Armenia, until 1995 (replaced with the National Assembly of Armenia). Supreme Council of the Karelian Autonomous Soviet Socialist Republic, existed during 1938–1994, except for the 1940–1956 when the erstwhile Karelian ASSR was a union republic, the Karelo-Finnish SSR. Supreme Council of Crimean Autonomous Soviet Socialist Republic, during 1938–1946 and 1991, transitioned to Verkhovna Rada of Autonomous Republic of Crimea (in Ukrainia). ^ a b John Alexander Armstrong (1986). Ideology, Politics, and Government in the Soviet Union: An Introduction. University Press of America. ISBN 0819154059. ^ Supreme Council of the Soviet Union. "Portal SSSR". ^ Supreme Council of the Soviet Union new composition. "Portal SSSR".